I know this has been discussed over and over again, and it may be very boring and annoying for people who have been around a while, but I'm telling you: Unless this need is fulfilled, it will continue to come up again and again and again. I've read the other posts about this matter, and as far as I can see some of the best arguments have been put forward by Neysor. "If you need serious math, the question / answer does not belong on stackoverflow anyway." Well, this may be true when we are talking about programming in C or Visual Basic. It is not true when we are talking about programming in Matlab, or R, or Octave, or Scilab, or … Questions about these languages very often involve the translation of mathematics into code, or programming problems are related to a misunderstanding of the math. Asking such questions and answering them is much facilitated by being able to use mathematical notation. Just a few examples I happened to be involved in: here, here, here, and here. I'm sure there are many more. I guess one might argue that questions about Matlab & Co. do not belong on stackoverflow because it is a different kind of programming. But the fact remains that the majority of Matlab questions on stackexchange are on stackoverflow, and as long as there is no matlab.stackexchange.com, I'm pretty sure they will continue to pop up here. "Enabling this means introducing an extremely heavy dependency." This does not correspond to my experience on other sites like math.stackexchange that do use MathJax. More objectively speaking, according to this detailed explanation it is simply wrong. The impact on pages that do not need math is minimal, and those that need it, well, need it. Talking about dependency in the sense of "it breaks if something goes away": Given its success, it is very unlikely that MathJax simply goes away, and it is much more likely that those image sites that people use now as a replacement will cease to exist. Moreover, if MathJax goes away there's still the LaTeX code itself which stays decipherable, while if an image site goes away, there's nothing left at all. "The developers have better things to do." "Enabling math puts an additional burden on the stackoverflow server." The actual rendering is implemented completely client-side. So, as far as I can see, there is no valid reason not to enable MathJax on stackoverflow. Tell me if I've missed one. That's a significant performance penalty, even when "it's not doing anything". 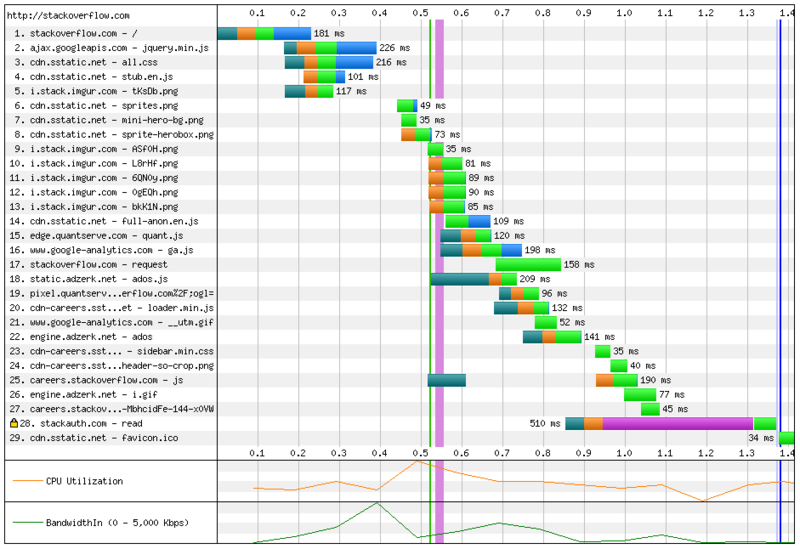 We're talking about a 21.3% increase in page load time for a user first hitting the site. Math.StackExchange is provided as a reference because it has the same HTML structure and content (besides MathJax), and actually has some work for MathJax to do...Stack Overflow has none. Keep in mind the exact same servers run all of these, they're literally the same application pool in IIS. Also keep in mind the testing scenario actually helps MathJax percentage-wise. Many of the other domains being hit, namely: edge.quantserve.com, pixel.quantserve.com, www.google-analytics.com and ajax.googleapis.com are very likely to be in the DNS cache for a client already - they are used for analytics on many websites. You're seeing costs for those that, on average, is very unrealistic. beta.mathjax.org? that one's not going to be cached for most Stack Overflow users. Furthermore, jQuery, Google Analytics and QuantCast scripts are likely to be cached...many of those requests aren't just "not a DNS hit"...they're pure cache hits and have practically no time penalty. This is the one certainty in programming: doing something is more expensive than doing nothing. When it comes to Stack Overflow we have to have a very, very compelling reason to make it any slower. I'll actually write a blog post soon as time allows on SSL and why it'll be optional (e.g. via HSTS) at first for the same reason. To put things in an aggregate perspective: The homepage is loaded roughly a million times a day on stackoverflow.com, so on an average of 295ms slower x 1 mil hits = 81.9 hours a day of additional load time and 3 million extra requests. I won't go into how much harder this hits mobile users where HTTP requests are even more expensive. Could we move that config to our CDN, to our site? Sure, but it still has to load for the page to continue. Either way, it significantly delays the time before the page is usable for the user. While loading MathJax for all pages is clearly not a good idea, there are other options. There's already support for specifying a language for each code block: Syntax highlighting language hints . The comment should only affect the immediate block following it. Only applicable to posts - does not affect titles, comments. No breaking changes - you only get math where you explicitly ask for it. Server knows whether MathJax is needed for a page or not, loading it only when necessary * does not slow down most pages (including homepage). Incompatible with Ajax (?) - Edited/new posts, pagination. So, as for "The developers have better things to do", this might need some option to enable it per-post? It's not just the pageload that takes a hit. It's the preview that takes a hit, too. I've noticed that typing answers on Physics and Math is slower than on SO and MSO, probably because the preview reruns the mathjax renderer every keystroke. 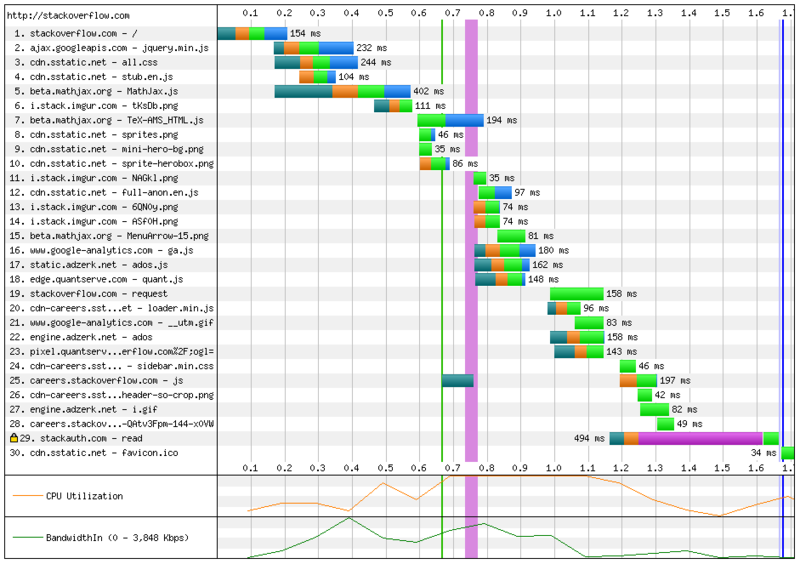 Yes, this could be improved to behave like prettify where prettyprint is only run once every X seconds. But you usually want an immediate preview for MathJax because TeX is hard. Also, matlab on Stack Overflow is tiny compared to php and jquery and bash and asp.net and ruby and perl and .... a lot more. ALl of these languages love the dollar symbol, and have it to denote variables or something similarly common. Of course, code formatting protects these from MathJax, but not everyone uses code formatting. In contrast, for matlab, you probably don't need TeX in every post. I agree that I'm no part of the tag community so I may be horribly wrong here, but most of your questions don't seem to be the type that require math. I guess it could be loaded on a per-tag basis as well. Or use something like the fiddle listed here that let one decide to load MathJax dynamically. Not the answer you're looking for? Browse other questions tagged feature-request status-declined mathjax . Is it necessary to include LaTeX? How to format mathematical expressions? Why is MathJax enabled on Code Review but not here? Why not upload images of code on SO when asking a question? How to draw a simple tree in the Stack Overflow editor?